The WHALE Oil and Debris Blocker is the perfect tool if you are looking for a system that prevents oil and debris from mixing in with clean water. With the WHALE, you can stop the pollutants before they reach the stormwater outflow. 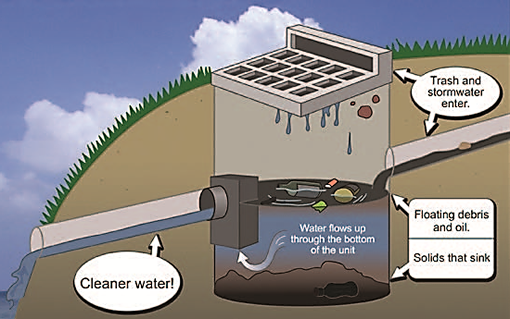 The system works by forcing stormwater to flow through the bottom of the unit; so, trash and hydrocarbons remain on the water's surface and away from the outflow. Item #S027 8" with Center Opening 4 1/2"x12"x14" 4 lbs. Item #S028 10" with Right Opening 5 1/2" x 14" x 16" 6 lbs. Item #S029 10" with Center Opening 5 1/2" x 14" x 16" 6 lbs. Item #S030 10" with Left Opening 5 1/2" x 14" x 16" 6 lbs. Item #S031 12" with Center Opening 6 1/2" x 16 3/8" x 18" 7 lbs. Item #S032 10" Adapter 9 1/2" x 10" x 12" 2 lbs. Item #S033 12" Adapter 11" x 12" x 12" 3 lbs. Note: Adapter is required for any 10" and 12" WHALE Installation. The 8" unit is one piece.